I want to thank you for coming into my son’s life 13 years ago. You probably didn’t know what awaited you when you were taken off that store shelf by my good friend to be given to a very small, underweight, 8 month old boy that had come 1/2 way across the world to be with his forever family and officially give me the title of Mother. 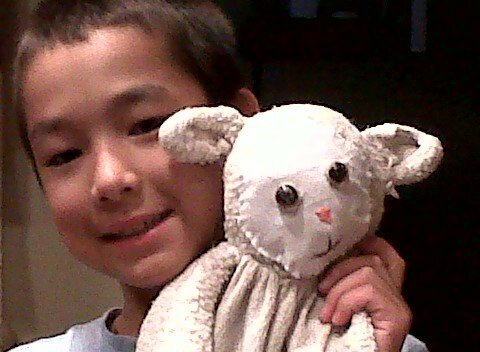 You had no idea that you would become comforter, spit and tear catcher, a pillow, a rug, but best of all a buddy to a little boy that had little love in his first 8 months of life. Your silky edges became frayed from the endless rubbing between my boys fingers, and those same silky edges spent time in my son’s ear and in his mouth. You endured being very smelly and disgusting from dirt, spit, and even pee. And you also endured many “baths” in the washer. Your buddy didn’t like when you had to be washed and feared your time in the dryer. So I made your laundering an adventure. You were going out to sea, you were going to space, you were swimming in the olympics, you were being blow dried and primped, you were returning from space…we would not let you fry in the dryer. When your boy was still quite young I made the mistake of locating another lamb just like you. I ordered it thinking that you would get lost for good or disintegrate and a back-up Baa would be needed. I had your boy’s name and birthdate embroidered on that new lamb. When it came it was starched and clean. Next to the new Lamb you were faded and worn out looking. I thought you would be replaced and I could bag you up for posterity. But no, your boy liked the new lamb but he never abandoned you. He christened the new lamb “New Baa” and you became “Old Baa” but you were always the preferred Baa. If he had New Baa with him I knew he could not find you or else you would be there too or instead of New Baa. You lost luster in my eyes who likes shiny and new things – for that I am sorry. Though you faded physically your value never faded in the eyes of a little boy. I am sorry that you were attacked by our dogs on a number of occasions and I thank you for allowing me to sew your face back up on more than one occasion. The worst attack took your entire face and I couldn’t stand to see you faceless so I made you a new one- it wasn’t pretty but I did my best. You looked glorious to my son and thats what mattered. Sadly your face didn’t last long the dogs are harsh to stuffed beings but your boy loved you faceless and all. Your boy is a teen now and would not admit to still needing you but I find you still in his sheets, or stuffed in a bag that he’s taking on vacation, most recently I found you just laying neatly on the edge of your boys bed – still wanted and still needed. Life can be harsh and growing up scary and it’s nice to have something comforting to turn to. You have been that for your boy. There will be a time I am sure where he will allow me to give you one last bath and to pack you away so he can see you again when he wants to bring back good memories. When that day comes I don’t know who it will be harder for him or me. While you are still around I know that little sweet boy is still there-that he still needs the comfort of his lamb and his mom. Will packing you away mean he doesn’t need us anymore? I’d like to think that we gave him the love and comfort that will have grown him into a kind and compassionate adult one that never forgets those that have loved and comforted him through the years. Thank you Baa for being more than just a stuffed lamb. Every person in this family has been touched by you. Ask any member about Baa and there is a smile and a story. 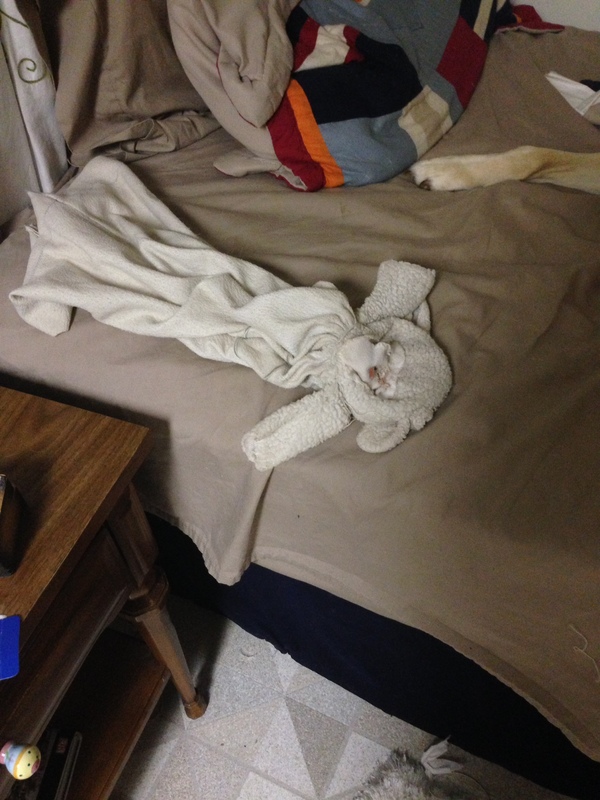 The story for me is about a stuffed lamb who came to be with a little boy in need of love and became his friend for life….Baa you will never be forgotten…..